Its fun and easy to learn astrology if you take it one step at a time. Astrology is the science of finding connection between those of us on the Earth and the Cosmos. It follows the patterns of movement by the planets and stars and assigns meanings to them that relate to human motivation and consciousness. Astrology is not a simple meaning like what you read in the horoscope section of the newspaper. A true astrological report takes into account not only the Sun sign (what you get in the paper), but the placements of all the planets of our solar system and sometimes other celestial bodies as well in relation to your birth time. When all these meanings are compiled, it becomes a very complex and detailed description of a persons profile. Symbols constitute Astrologys primary language. Each Zodiac Sign and Planet is represented by a symbol and/or a glyph. Zodiac Signs fall into several categories. These categories are: Duality, Modality and Elements. Learn more about classifying Zodiac Signs. In step 2 you learned how to classify each Sign. Now you will learn the interpretation for each individual Zodiac Sign. Before taking this exam you should quickly review the last 3 steps. The answers to this exam can be found further down on this page. Good Luck! Each of the 12 Signs has a planet(s) associated with it. These are called the Ruling Planets. The Astrology Chart also divides into 12 houses and has a house number coinciding with it. Another important part of astrology is the geometric angles the planets make to one another. These angles are referred to as Planetary Aspects. Learn more about the planetary aspects in astrology. Before taking this exam you should quickly review steps 5, 6, & 7. The answers can be found further down on this page. Good Luck! a) You take each planet & point and interpret it in each Zodiac Sign. b) You take each Planet and interpret it in each house. c) You take each planetary aspect and interpret it. d) Analyze the data from a-b-c and get an overall feel for the chart as a whole. And thats it! By now you should have a decent working knowledge of how astrology works. Youre now ready to take that last Step. 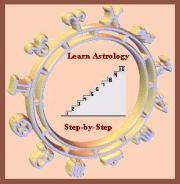 This examination will cover all the material presented in Learn Astrology. Good Luck. Start interpreting your Birth Chart. SUN SIGNS - Know Thy Sign - Know Thy Personality is the optimal point to begin your journey into self discovery.